Just a quick little post today. I pieced the teapot with Basic Grey Sultry dsp, and put it on a "tablecloth" made from cutting a scallop square in half and adding piercing. 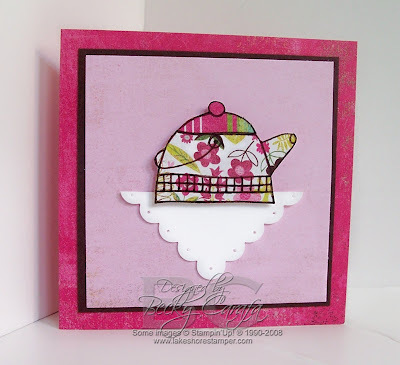 I mounted the teapot/tablecloth on more Sultry and chocolate papers, and there you have it! There isn't room for a sentiment, so I'll stick one on the inside before this goes somewhere! Thanks for stopping by today! Tomorrow I'll have a card for you that uses a new set from the upcoming Holiday Mini, so don't miss it! Hi Becky! I loove your littel tablecloth - how cute is that? How funny, I used the cherries from this stamp set today. And finally, thank you for your cute card - always brings a smile to get "fun" mail. HOw cute!! Love that paper piecing! So cute Becky! How creative to use the scallop square for your table linen!